The Camargue is a natural region in the South of Provence, between the Mediterranean and the Rhône delta. The Camargue houses the Natural Park of the Camargue (a UNESCO site) and hundreds of different species of plants, flowers, trees and animals, like the famous birds or Camargue horses. In this unique wetland, you can experience nature in its purest form – by foot, by bike or by car – and you can see some landscapes which you cannot find anywhere else, such as brine lagoons. Close to Park, you can find the small village of Aigues Mortes, a fortified city from where Louis IX started his crusades: there, you will see both medieval sights and modern structures, built to deal with floods and water. Arles is a city in the south part of Provence which is mainly famous for the Roman and Romanesque monuments and sights spread around the town. Most of the sight are listed as UNESCO World Heritage Sites. The most important among them is the Roman Arena, inspired by the Colosseum: it has two tiers of arches and it has been recently used also for nonviolent bullfights. Another important sight is the Gallo-Roman theatre, where plays, orations and pantomimes were held. Besides, you can visit the church of Saint Trophime, a Roman Catholic building with Romanesque architecture: there, you can admire decorated columns, Last Judgement’s sculptures and even a cloister. In the city centre, you can relax in Republic Square and, if you are interested, you can visit some important museums, such as the ancient history museum of Arles. The city is famous also for the heritage left by Van Gogh: he lived there one year and produced over 300 paintings: around the city, you can see many of the landscapes and sights he used as subjects for his paintings – the starry night, the yellow house, the river, the arena, the café at night and so on – and you can learn about his life and his style at the amazing Foundation Van Gogh. Les Baux is a small village on the top a rock outcrop and surrounded by castle ruins. 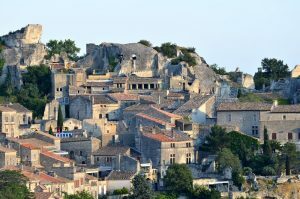 It lies in the Alpilles mountains and it has been listed as one of the most beautiful villages in France. The picturesque small village welcomes every year millions of visitors and offers main important and breathtaking sites: first of all, the Castle ruins, on the top of the village; then, St. Vincent church, partly excavated in the rock, which contains several historical objects. You can also reach the lower town and visit some markets, or visit some specific museum, dedicated to ancient weapons and history. In this village you can also have the opportunity to enjoy the so-called Carrières des Lumières, a permanent show where images are projected on the walls of galleries dug in the rock in order to plunge the spectator in a unique visual and musical universe. 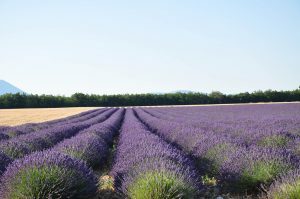 The lavender is probably the most known element of Provence: every year, lavender fields attract thousands of tourists from all over the world, for their colours, their fragrance and the amazing landscapes. The natural region called Plateau de Valensole is composed by small villages, local producers’ estates, small mountains and, above all, an infinite number of purple, yellow and green fields. This “lavender countryside” offers a unique landscape: there, you will feel free, relaxed and nature will help you to forget all the stress and the problems. Lavender usually blossoms June to August and can be used to create any kind of product: honey, essential oils, soaps, food and many others. 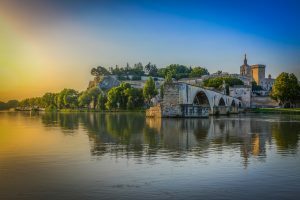 In the area, you can also find many festivals and funfairs, along the way which links all the small villages through the lavender fields, such as Forcalquier, Castellane and Aiguines (in the latter, you can visit a beautiful chateau on the top of a hill). 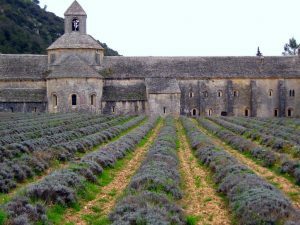 By foot, by bike or by car, there are several ways to enjoy the area and experience all the different varieties of lavender: the rare and ancient lavender “des hauteurs”, that grows on the hills; the mixed “mosaïque” lavender, which grows next to vineyards and other plants; the well-known “site” lavender, which grown with cereals and plays a crucial role in rural landscapes. Moving from this region towards Avignon, you will also have the chance to visit the famous Luberon villages: typical rural houses, ancient streets and seasonal markets will let you taste the real provençal flavour! 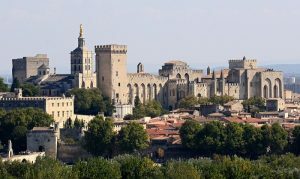 Aix-en-Provence, or simply Aix, is a small elegant town 20 minutes from Marseille. Strolling through the Cours Mirabeau, you will see all the most important sights of the town. 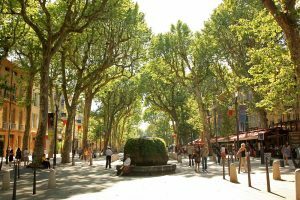 Fountains, elegant houses, medieval monuments and bohemian brasseries: Aix-en-Provence has all that you need to relax and have fun. Starting your walk from the Cours Mirabeau, you can pass by the old town and its houses from the 16th and 17th centuries; you can see some brasseries where Cézanne and Hemingway used to go, as well as the impressive Cathedral. The medieval part of the town offers an insight into Gothic architecture, whereas the Merovingian Baptistery and the archbishop cloister are built in the Renaissance and Romanesque styles. The Quartier Mazarin is without a doubt the most typical part of the city, with some “Hotel Pariculiers” (townhouses) that you cannot miss. 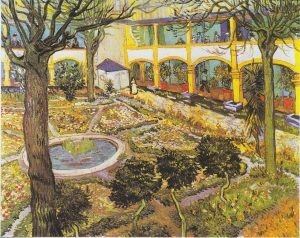 Within the city, several musuems are worth the visit: first, the Museum of Natural History, where you can learn about Provençal and French past centuries; then, the Museum of Viel Aix, with several collections about the town. 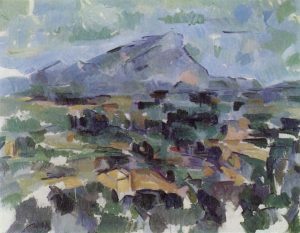 Not far from the city, you can see – and, why not, reach – the impressive Montagne Saint-Victoire, one of Cézanne’s favourite landscapes and subjects: enjoy the view and feel like all the painters who lived here! Close to Aix and Marseille, you can also find the “calanques”, in Cassis, sheltered inlets and cliffs along the Mediterranean that you can “visit” by boat. 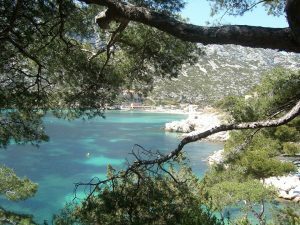 From these calanques, you can also reach the small island where the Count of Monte Cristo was held! Last but not least, in Aix-en-Provence you can join, in June and July, the important International Festival of Lyrical Art, with shows all around the city, housed by theatres, monuments and old buildings.